A cute little idea for your Christmas Place Names, perfect with after dinner coffee, once it serves its purpose! Kids would feel involved and would also love to help make them! Heat butter and marshmallows until butter is melted. Stir butter and marshmallows together until smooth. Add green food coloring and stir well. Add the puffed rice and combine until it is evenly coated. Wet hands with water and scoop out a handful of marshmallow mixture. Form into a cone shape. Set aside and do the same with rest of the mixture. Decorate trees with the silver balls. Place a toothpick on top of the tree before they set as then it will be too hard. 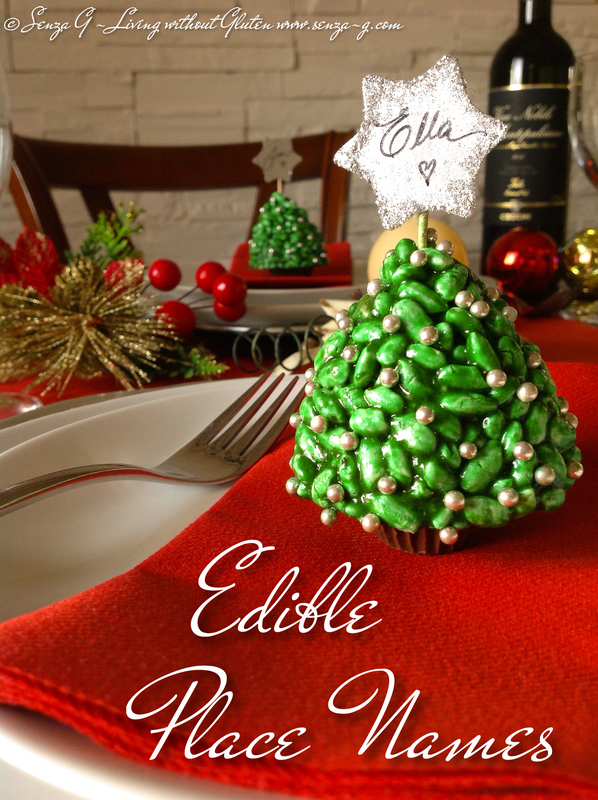 Place tree on top of the little chocolate cup to create a tree base. You can secure it with a little melted chocolate. Cut out stars out of cardboard, I sprayed mine silver and put some glitter around the edges, and write the guests’ name on them. Make two for each tree, one front one back. Stick with a little glue but leave a gap at the bottom so you will be able to slide the star onto the toothpick. * I did not have any little chocolates at hand, so I made mine by melting a little chocolate and filling up little paper cases. Left it in the fridge to set hard and then peeled off the paper. Note – Marshmallows have to be fresh as otherwise you will have difficulty melting them.